In the technology world's equivalent of a teenage sulk, Amazon has told the Federal Aviation Agency that "without approval of our testing in the United States, we will be forced to continue expanding our Prime Air R&D footprint abroad." 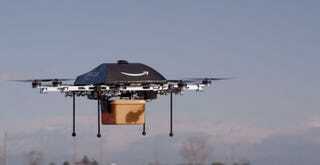 It's now more than a year since Amazon announced its Prime Air delivery service. But things aren't moving fast enough, with the FAA dragging its heels over Bezos & Co.'s testing. So far, Amazon has yet to gain permission for outdoor trials in the U.S., which makes the idea of parachuting in soft-backs from the skies all but impossible. Reuters points out that the FAA has agreed that six sites for commercial drone testing be opened, but Amazon's wasn't one of them. What's more, theWall Street Journal suggests, is that while there are fewer than 10 approved commercial-drone operators in the U.S., Europe has thousands.